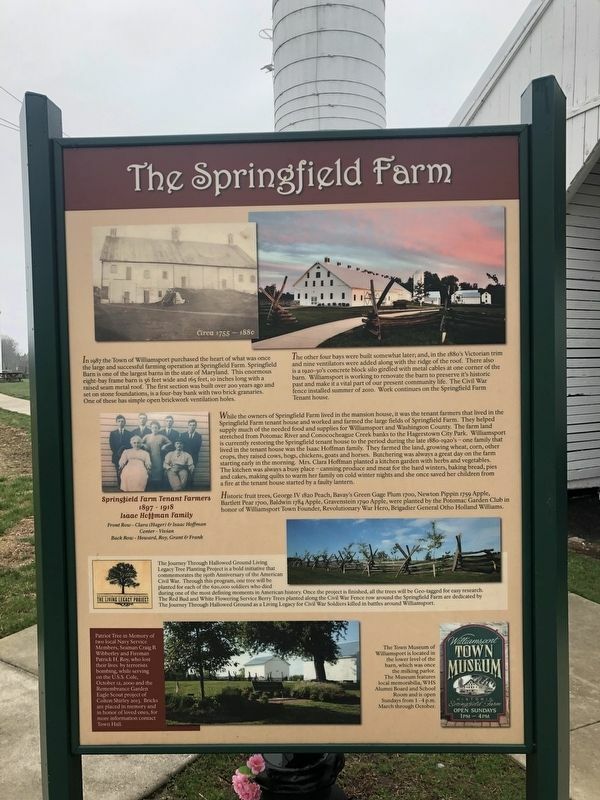 In 1987 the Town of Williamsport purchased the heart of what was once the large and successful farming operation at Springfield Farm. Springfield Barn is one of the largest barns in the state of Maryland. This enormous eight-bay frame barn is 56 feet wide and 165 feet, 10 inches long with a raised seam metal roof. The first section was built over 200 years ago and set on stone foundations, is a four-bay bank with two brick granaries. one of these has simple open brickwork ventilation holes. The other four bays were built somewhat later; and, in the 1880's Victorian trim and nine ventilators were added along the ridge of the roof. There also is a 1920-30's concrete block silo girdled with metal cables at one corner of the barn. Williamsport is working to renovate the barn to preserve it's historic past and make it a vital part of our present community life. The Civil War fence installed summer of 2010. Work continues on the Springfield Farm Tenant House. of Springfield Farm. They helped supply much of the needed food and supplies for Williamsport and Washington County. The farm land stretched from Potomac River and Conococheague Creek banks to the Hagerstown City Park. Williamsport is currently restoring the Springfield tenant house to the period during the late 1880-1920's — one family that lived in the tenant house was the Isaac Hoffman family. They farmed the land, growing wheat, corn, other crops, they raised cows, hogs, chickens, goats and horses. Butchering was always a great day on the farm starting early in the morning. Mrs. Clara Hoffman planted a kitchen garden with herbs and vegetables. The kitchen was always a busy place — canning produce and meat for the hard winters, baking bread, pies and cakes, making quilts to warm her family on cold winter nights and she once saved her children from a fire at the tenant house started by a faulty lantern. Historic fruit trees, George IV 1820 Peach, Bavay's Green Gate Plum 1700, Newton Pippin 1759 Apple, Bartlett Pear 1700, Baldwin 1784 Apple, Gravenstein 1790 Apple, were planted by the Potomac Garden Club in honor of Williamsport Town Founder, Revolutionary War Hero, Brigadier General Otho Holland Williams. The Journey Through Hollowed Ground Living Legacy Tree Planting Project is a bold initiative that commemorates the 150th Anniversary of the American Civil War. Through this program, one tree will be planted for each of the 620,000 soldiers who died during one of the most defining moments in American history. Once the project is finished, all the trees will be Geo-tagged for easy research. 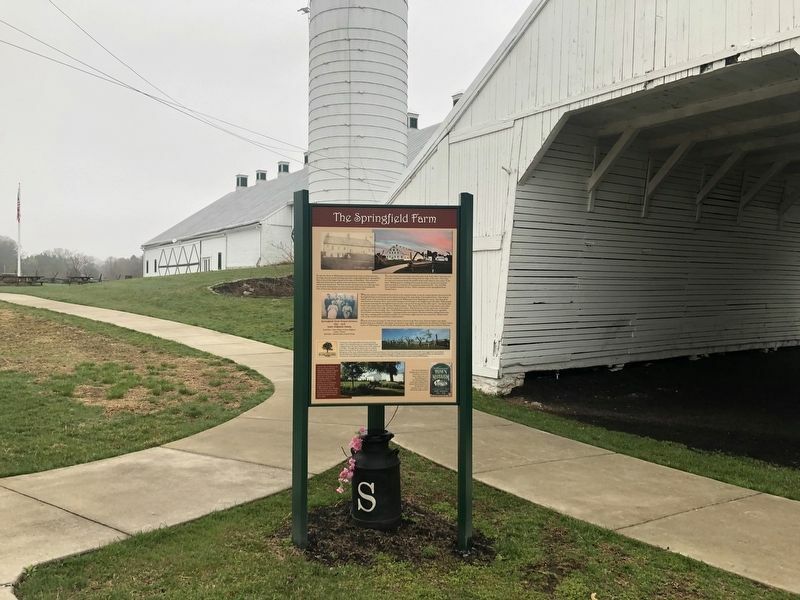 The Red Bud and White Flowering Service Berry Trees planted along the Civil War fence row around the Springfield Farm are dedicated by The Journey Through Hallowed Ground as a Living Legacy for Civil War Soldiers killed in battles around Williamsport. Patriot Tree in Memory of two local Navy Service Members, Seaman Craig B. Wibberly and Fireman Patrick H. Roy, who lost their lives by terrorists bombing, while serving on the U.S.S. Cole, October 12, 2000 and the Remembrance Garden Eagle Scout project of Colton Shirley 2013. Bricks are placed in memory and in honor of loved ones, for more information contact Town Hall. The Town Museum of Williamsport is located in the lower level of the barn, which was once the milking parlor. The Museum features local memorabilia, WHS Alumni Board and School Room and is open Sundays from 1 - 4 p.m. March through October. Location. 39° 35.894′ N, 77° 48.898′ W. Marker is in Williamsport, Maryland, in Washington County. Marker can be reached from Springfield Lane south of Maplehurst Avenue, on the right when traveling south. Touch for map. Marker is at or near this postal address: 2 Springfield Lane, Williamsport MD 21795, United States of America. Touch for directions. Other nearby markers. At least 8 other markers are within walking distance of this marker. The Wagoner's Fight - July 6, 1863 (about 400 feet away, measured in a direct line); Boy Scout Troop 17, 100 Years Old (approx. 0.2 miles away); Band Stand (approx. 0.2 miles away); Williamsport (approx. 0.2 miles away); a different marker also named Williamsport (approx. 0.2 miles away); The Wagon Train of the Wounded and Williamsport (approx. ¼ mile away); a different marker also named Springfield Farm (approx. 0.3 miles away); The John Brown Bell (approx. 0.3 miles away). Touch for a list and map of all markers in Williamsport. More. Search the internet for The Springfield Farm. Credits. This page was last revised on April 6, 2019. This page originally submitted on April 6, 2019, by Devry Becker Jones of Washington, District of Columbia. This page has been viewed 50 times since then. Photos: 1, 2. submitted on April 6, 2019, by Devry Becker Jones of Washington, District of Columbia.